I have fallen in LOVE with my molds for cake pops. 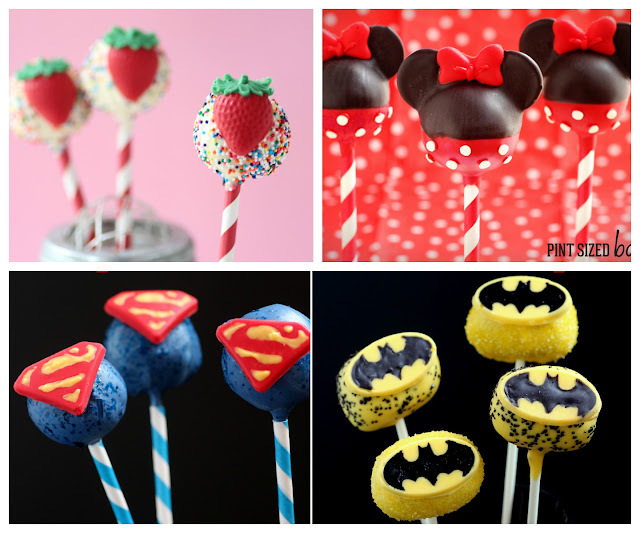 It really makes it so easy to take a cake pop from cute and fun to OMG THAT’S SO CUTE! 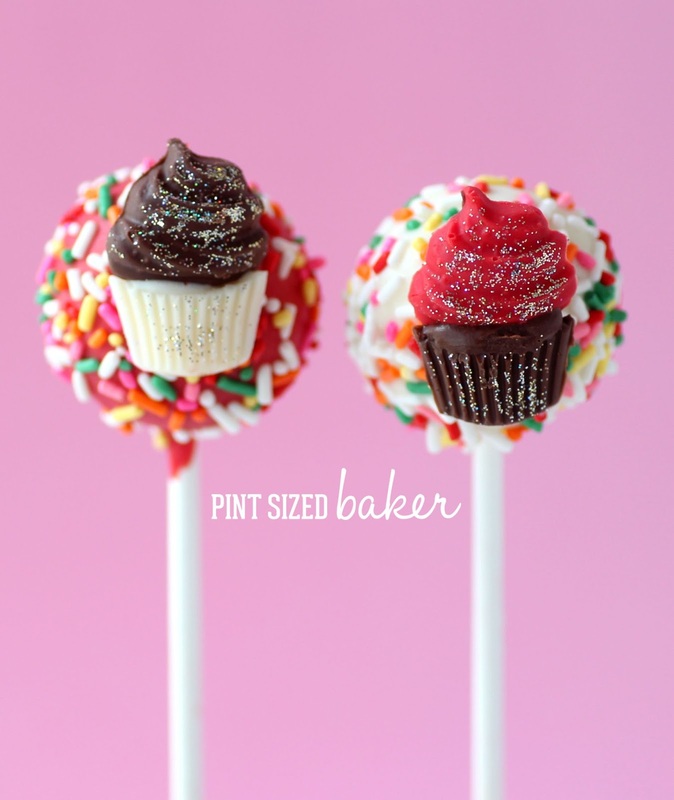 I made some basic rainbow confetti cake pops and although I liked them, I felt that they needed just something else to add a fun twist to them. 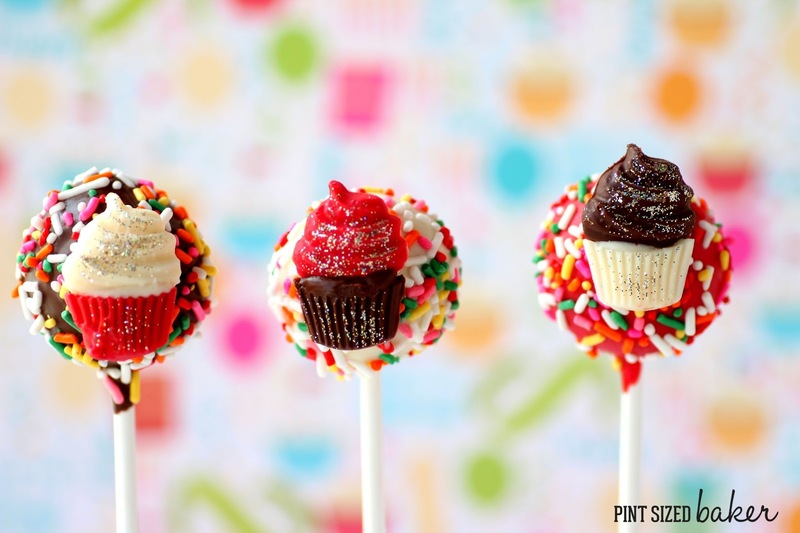 If you know how to make cake pops.. dip cake pops… add sprinkles to cake pops… just take it one step further and add some fun molded candy. These cupcakes were so cute and the perfect size to add to the cake pops. I used the Martha Stewart Crafts Silicon Moldthat I used for the Strawberry Cake Pops that I did a few weeks ago. This is one of the molds in the kit. It’s so easy to use these little molds. I found them at Michael’s and they have been great. I filled the tops and bottoms with some candy melts, tapped the mold on the counter to get out any air bubbles and then put it into the freezer for a few minutes to harden. It went quicker if I set a 3 minute timer reminding me to take them out. Once they were out, I just sprinkled a touch of Rainbow Disco Dust over them to give them that little sparkle. Aren’t these just perfect for a birthday party? I think any little (and big) girl would live to have them included on their birthday. So these would be perfect for ANY DAY! 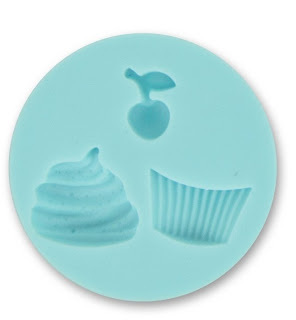 Make 12 Cupcake Candies using the mold and a handful of the candy melts. I found it easier to control adding the the candy by using a baggie and squeezing it into the mold. Give the mold a shake or tap it to get the air bubbles out. Then pop it in the freezer for 3 minutes and remove it. Take 1/4 of a cake and add frosting. Mix with a paddle attachment until all combined and smooth. It should have a play-doh like consistency. 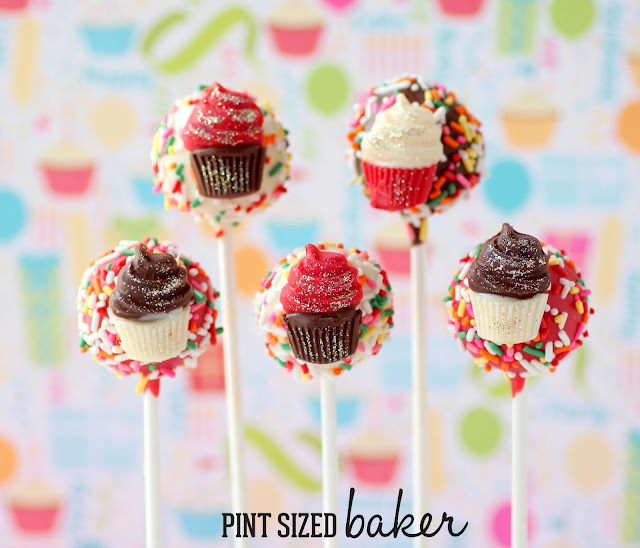 Measure out 12 equal sized cake balls using a 1 tablespoon cookie scoop. Roll the cake balls smooths then place them into the fridge. Melt the candy melts and stir until smooth. Remove cake balls from the fridge, dip the stick into the white candy and then insert it half way into the cake ball. Set it aside and complete all of them. Dip the cake pop into the candy coating it up to the straw. Tap off the excess and add confetti sprinkles. Stand upright to dry and continue all of the cake pops. Add a drop of candy to the bottom of the cupcake “Frosting” part and use it to glue it to the cupcake liner piece. Complete all pairs and dip your finger into the Disco Dust and gently sprinkle over the candy cupcakes. 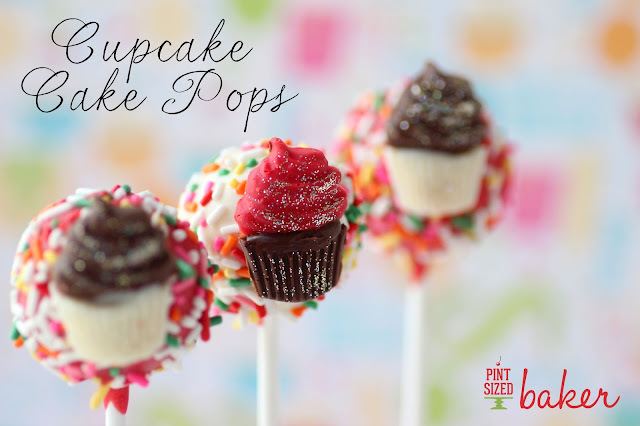 Now attach it to the cake pop. Hold it in place for a few seconds until the candy hardens. Be careful not to melt the cupcake candy with the heat from your hands.